Mexico-On-Line offers everything you need to plan and book your Mexico vacation. From detailed maps to great hotel deals, car rentals, and daily hotel specials - you can find it all on Mexico-On-Line. March 10th, 2017 - New York --Travel + Leisure magazine announced that San Miguel de Allende has placed number 4 in its World's Best Awards 2016 "Friendliest Cities in the World" category. The colonial city has already been named "No. 1 City in Mexico and Central and South America" and No. 3 in the overall category of "World's Best City" and it was also included in the 10 Best International Cities for Food. The awards were determined by readers of the publication, who were surveyed from Nov. 2, 2015 to Feb. 29, 2016. "It is an honor for San Miguel de Allende to be recognized in this category as it is a recognition of all our inhabitants who work to be an example of tourism at the highest level," said Ricardo Villarreal, Mayor of San Miguel de Allende. "Seven out of 10 jobs in our city are directly related to tourism and services around it and the inclusion of our city in this list shows that we are doing things right." "San Miguel de Allende is a beautiful city, where tourist and [local] alike greet one another daily with a smile," observed an impressed T+L reader in the magazine's brief on the city. "This UNESCO World Heritage site in Mexico, beloved for its rich arts scene and colonial architecture, also makes guests feel right at home." 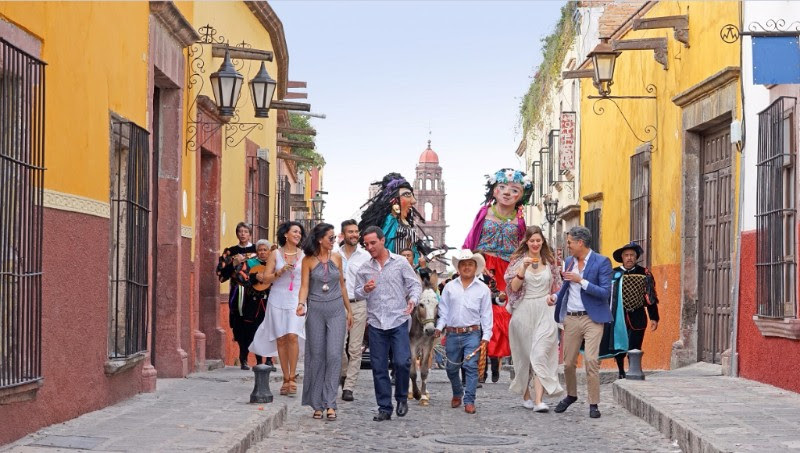 "This is an exceptional accolade for us to receive because we see San Miguel Allende as a welcoming destination where everyone is welcomed to experience a little part of Mexico" said Guillermo González, Director of the San Miguel de Allende Tourism Board. "It is also a great gift as we prepare to celebrate the city's 475th anniversary." San Miguel de Allende is named after General Ignacio Allende, one of the fathers of Mexico's independence. The city dates back to 1542 when it played an important role in the country's silver trade. San Miguel de Allende's historic center encompasses 24 blocks of walkable and welcoming streets, alleys, and paths without any traffic lights. Located in the Bajio region of Mexico, in the state of Guanajuato, San Miguel de Allende has enjoyed a favorable reputation because of its colonial architecture, year-round spring-like climate, colorful cultural celebrations, gastronomy and romantic setting. In recent years, it has become an important tourist center for Mexico and the world. The town has a mystical quality. Its picturesque cobblestone streets and colonial architecture -- combined with colonial-era traditions both religious and secular, a spectacular natural setting and the vibrant Mexican culture -- are only enhanced by the embrace of all its many facets by both the friendly locals and the diverse, melting-pot population comprised of hundreds of expats, representing 63 nationalities, who have made San Miguel de Allende their home. Los Cabos, Mexico (July 2, 2014) - The Los Cabos Tourism Board is pleased to announce two new flights via Delta Airlines beginning in December from the West Coast - San Diego and Seattle - and a new non-stop flight from New York's John F. Kennedy International Airport to Los Cabos, beginning on December 20. These three new flights, adding to the destination's already abundant airlift, will be accompanied by increased frequencies from other US cities. Beginning December 20, travelers from San Diego will be able to take a non-stop flight to Los Cabos International Airport (SJD) via Delta Airlines seven days a week and four times per week from Seattle. The Seattle - Los Cabos flight will be available through January 10; following that date, the flight will operate on Saturdays only. The JFK - SJD non-stop flight will operate on Saturdays only from December 20 through June 27, 2015. "We are pleased to announce the launch of the new flights from New York, San Diego and Seattle via Delta Airlines as these are three very important markets for us," said Eduardo Segura, Managing Director of the Los Cabos Tourism Board. "We are equally excited about the increased frequencies from other important markets as this will help meet the demand in travel to the destination and provide travelers with more flexible options when making travel plans." In total, there will be 34 additional operations a week to the destination via Delta Airlines which represents between 25,000 to 30,000 additional seats per year. New York February 27, 2014- Celebrating one of the longest runs in contemporary Mexican culinary events, the Puerto Vallarta Restaurant Week will turn 10-years-old in 2014 and participating establishments are ready with special menus to satisfy all tastes. Puerto Vallarta is one of Mexicos leading culinary destinations, offerings hundreds of opportunities for foodies to enjoy different types of gastronomy, including typical street food from families who have sold tacos and ceviches for generations to Five Star Diamond Award restaurants that offer the latest in international dishes. Foodies with special dietary needs will find that Puerto Vallartas chefs are more than willing to include dishes that are gluten free, vegetarian, vegan and organic dishes. Find your Treasure: A Bounty of Deals for Mexico & the Caribbean with Expedia! - Expires 11/11/13.